Drain and flush transfer case before starting with installation. Put transmission into reverse gear and set hand brake. Remove shift knob, floormat, and transmission floor plate. Clean the transfer case and P.T.O. unit (if installed). Remove the rear cover plate or P.T.O. unit and clean all surfaces of gasket material and burrs. 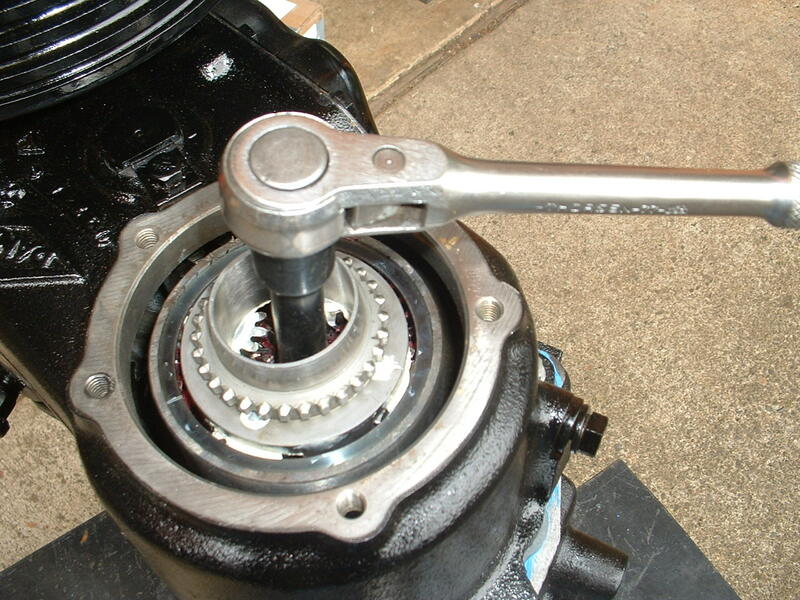 Using a socket wrench, remove the retaining nut that holds the stock drive gear in place. 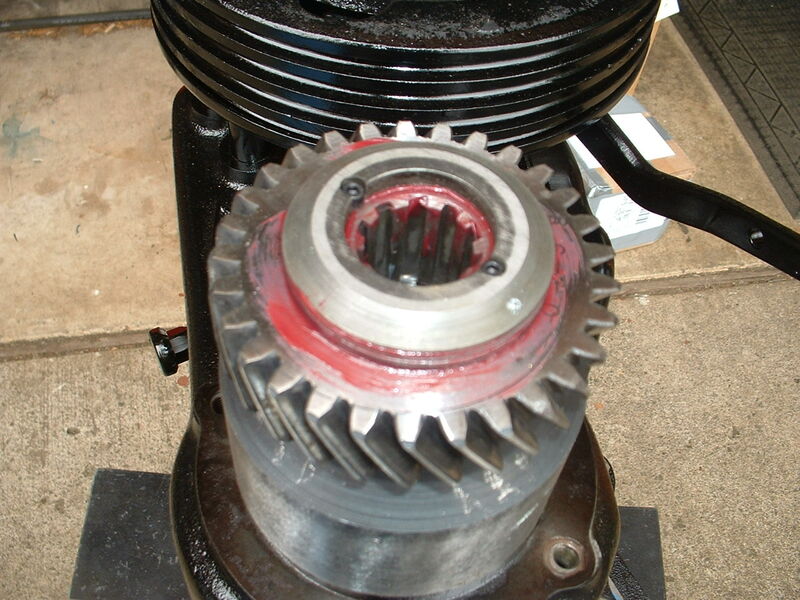 Remove the main drive gear and make sure the new planetary gear assembly has the same number of exterior teeth & interior spline. 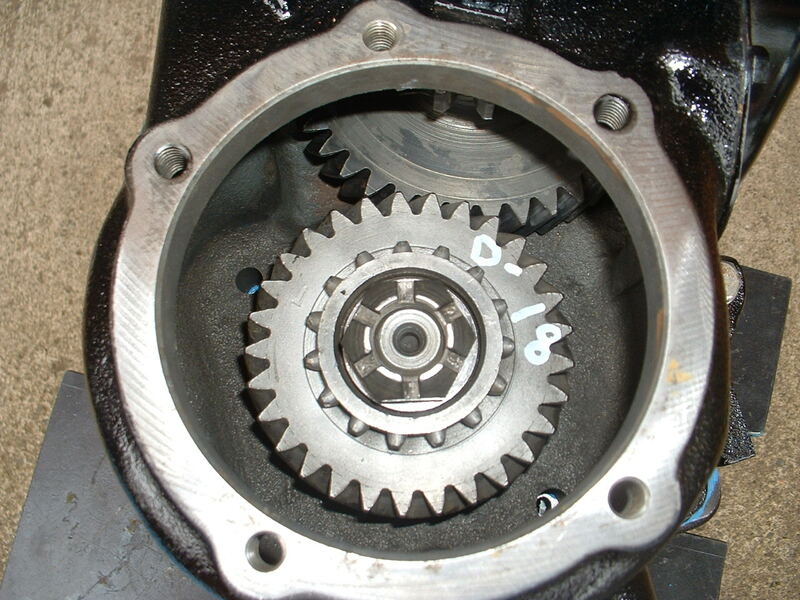 Check the transmission main shaft for end play and the transfer case intermediate gear assembly. 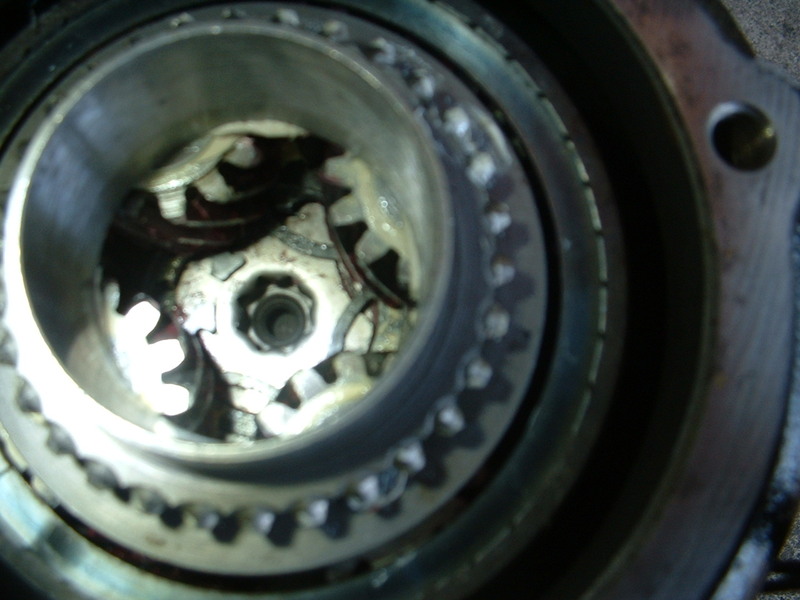 Replace any worn bearings and inspect the transmission rear output shaft bearing, replacing if necessary. (If installing overdrive unit, be certain that the spacer between the transmission output bearing and the main drive gear is not removed. This spacer is only on the T14 3-speed transmission). a. Use “snap ring” or “needle nose” pliers to install. this point, the ring will collapse and will not be suitable for use). seated in its groove. 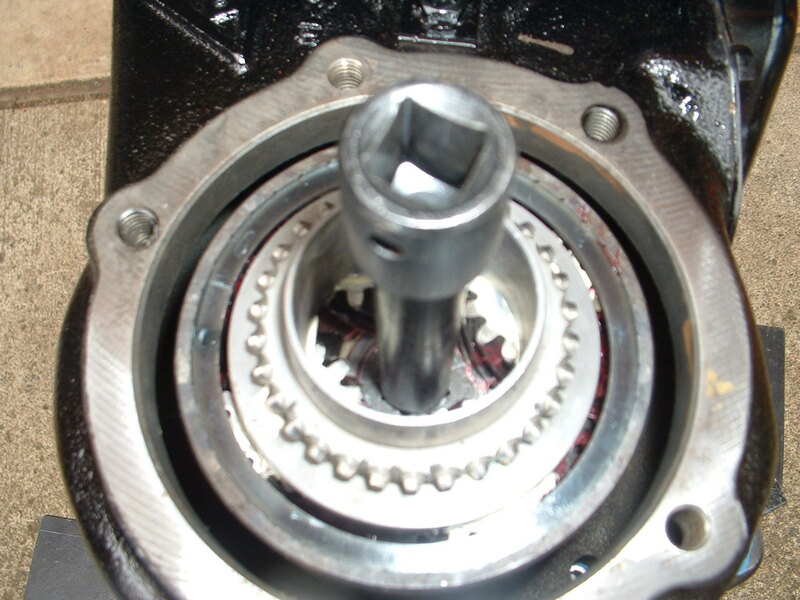 NOTE: If the snap ring is not properly seated in its groove, the planetary unit will eventually work loose on the main shaft and cause severe damage to the overdrive unit. Lift both rear wheels off the ground. Put the transmission into neutral, transfer case in gear and release the handbrake. Turn driveline by hand to check for free rotation and run out. If rotation is not free, recheck Step 3 & 4. Install the oil scoop into the case assembly. NOTE: Be sure the oil scoop is in place. 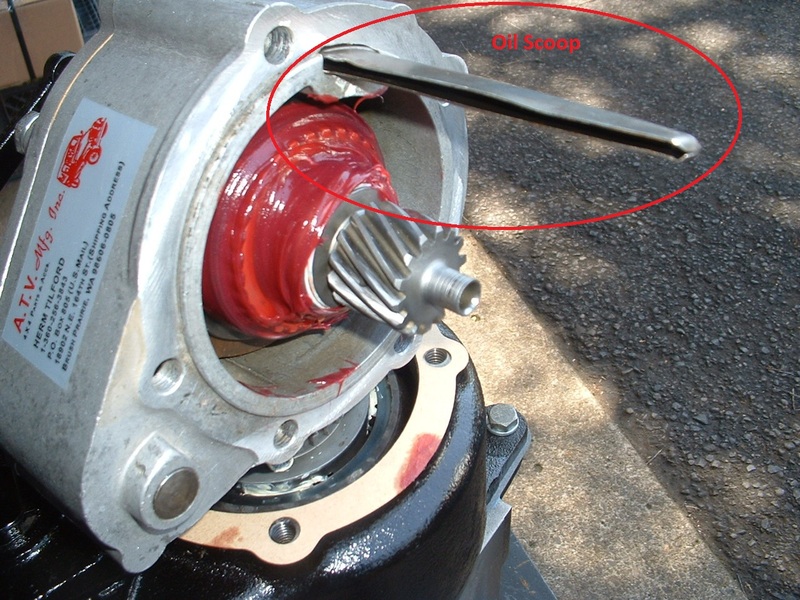 Failure to install this scoop will cause lack of proper oiling and eventual overdrive failure. Before assembly, you must verify the proper location of the gear assembly. This measurement of .667″ is taken from the case to the top of the planetary. Align the gasket to the rear of the transfer case and install the aluminum housing portion of the overdrive to your transfer case. (See images 1, 2, and 3). Caution should be taken to make sure the brass syncro-ring is properly seated before mating these units together. The three steel keys must interlock with the brass syncro-ring. We have packed grease underneath the syncro-ring to prevent it from falling out of position during assembly. 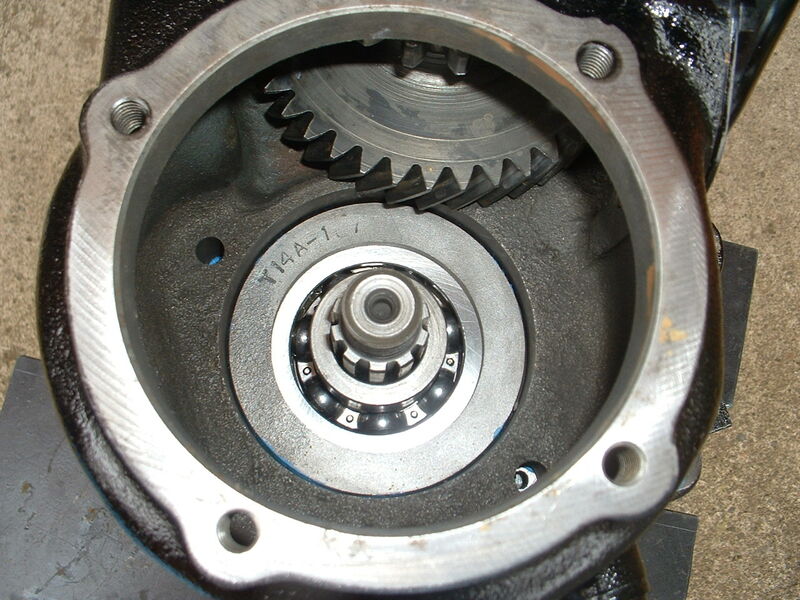 If the syncro-dogs do not line up properly, you will find a 1/4″ gap between the transfer case and the overdrive housing. DO NOT FORCE these components together. We have seen failure occur because of syncro-ring misalignment.Further precaution must be taken when installing your unit so that the planetary gears mesh properly. The overdrive unit may need to be rotated slightly to allow the gears to align correctly. 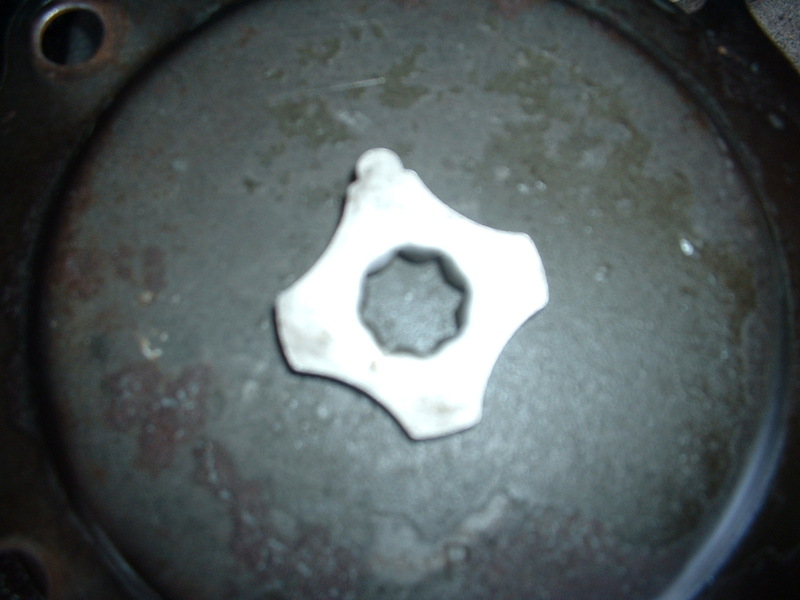 Once the unit is mounted flush to your transfer case, install bolts with lock washers and tighten to 30 ft./lbs.torque. 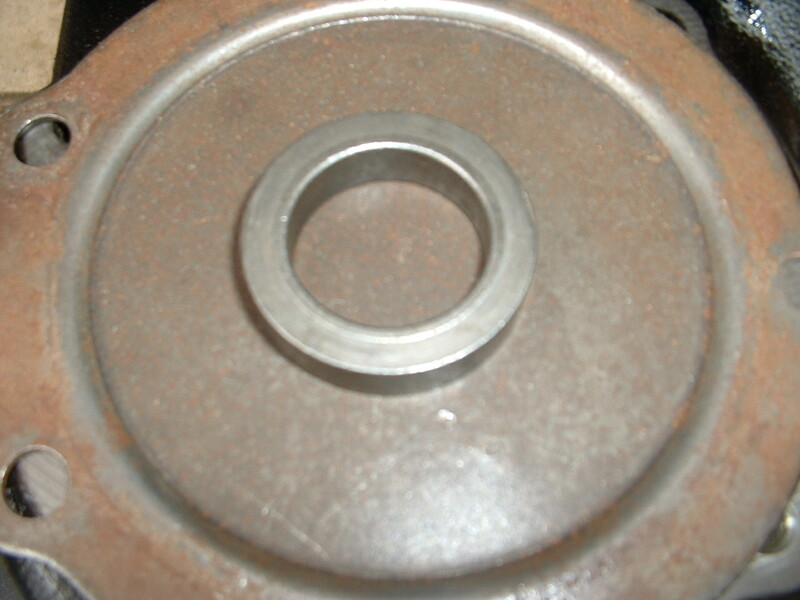 Make certain the seal washer is installed as shown. Turn the driveline by hand to check for free rotation. Install the shifter pivot mount and handle assembly to the transmission case. 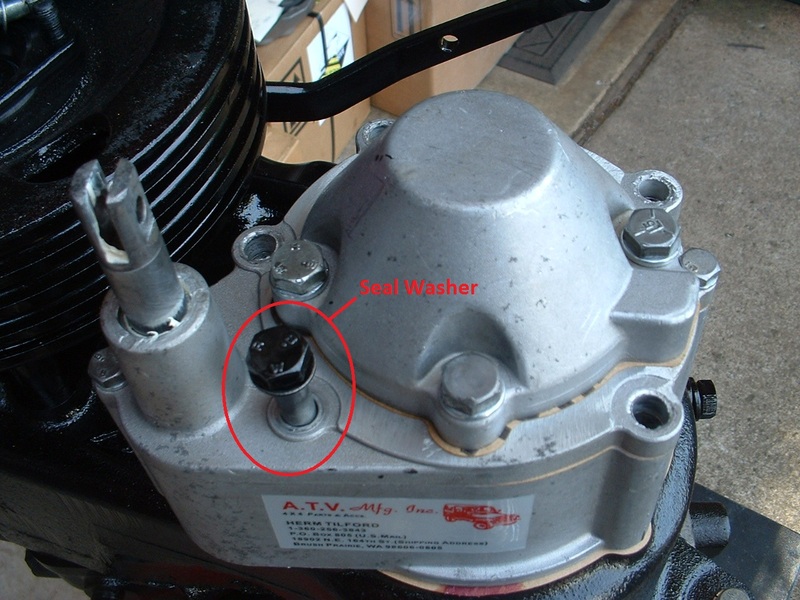 Before connecting the shift lever rod to the Saturn shift rail, you must remove and discard the small tube that was installed on the shift rail on the unit (do not remove this tube until the overdrive unit is installed on to the transfer case). Connect the shift lever rod to the overdrive unit and the shifter handle. Make sure you have proper clearance between shift rod, transfer case shifter, and vehicle body to assure quiet operation. Using the new shift boot retainer plate as a pattern, mark and cut a new lever opening in your transmission floor plate (removed earlier). Install this modified floor plate. Install the shift boot retainer plate and shift boot. Now is a good time to fill your transfer case with the proper lubrication. A high grade of gear oil (80-90w) is recommended. We DO NOT recommend the use of additives in the gear oil. DO NOT use synthetic oil. 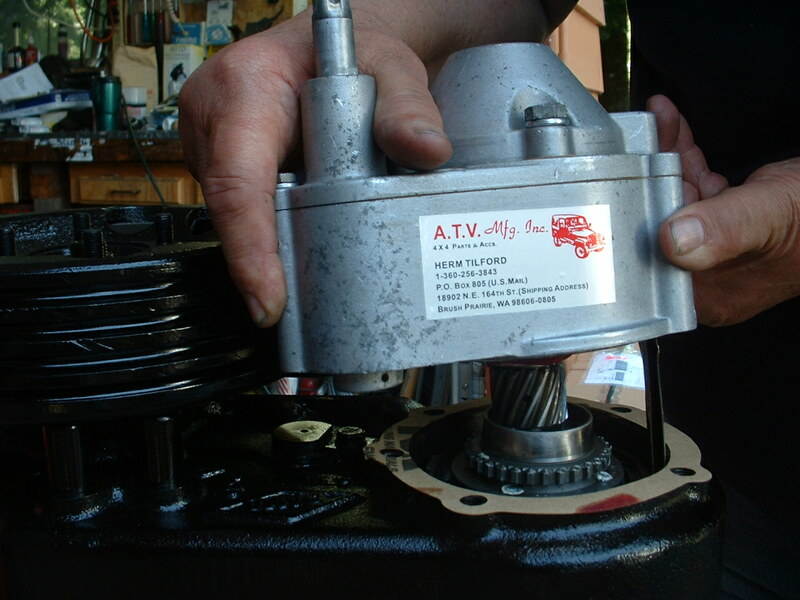 The oil level in the transfer case must be maintained at proper levels to assure maximum overdrive durability. Put the transfer case in neutral, the transmission in high gear, and the overdrive in the overdrive gear. Run the engine at a fast idle for 7 to 10 minutes. This will circulate the oil through overdrive unit. Stop the engine and recheck the oil level in the transfer case, and refill if necessary. About 100 miles after the installation of the overdrive, check and retighten the five (5) bolts that hold the overdrive unit to the transfer case (30 ft./lbs. torque) if necessary. Recheck the transfer case oil level once again. Click here for another website with detailed installation instuctions with plenty of pictures. Shifting the overdrive is done in the same manner as with a standard transmission, which is to release the throttle, depress the clutch pedal and shift. On automatic applications, the transmission should should be shifted into neautral. When the shift lever in the forward position, the unit is engaged in overdrive. When the handle is shifted back towards the driver, the unit is in direct. The Saturn is designed mainly to be used as an overdrive; however, it can be used in any transmission gear-shifted in direct or overdrive. Caution: The unit should not be used in overdrive when towing or pulling a heavy load. One very important thing is the positioning of the oil scoop #1133. 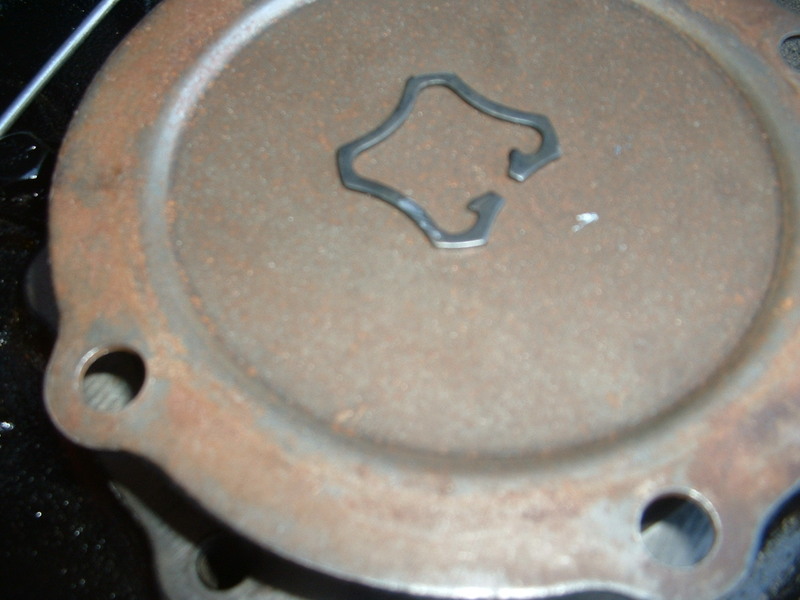 The oil scoop is the lifeline of your overdrive. 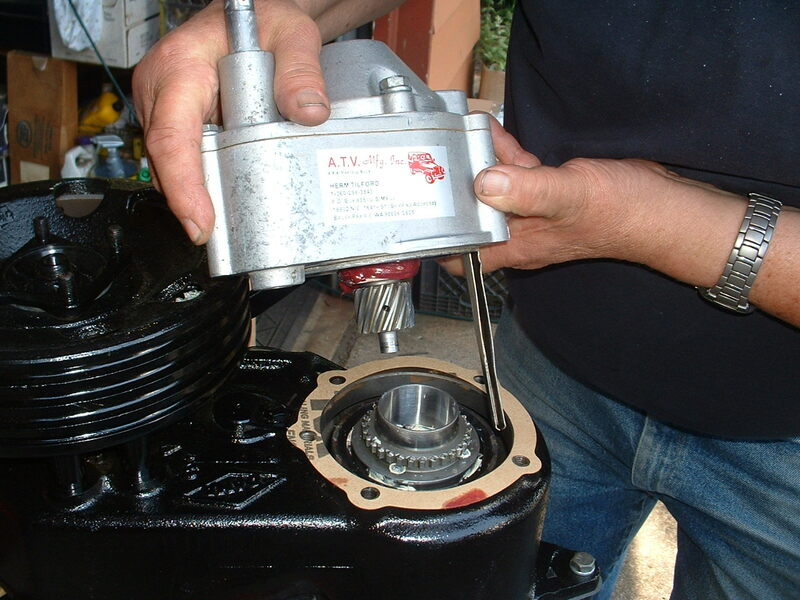 It must be properly positioned so that oil can lubricate the complete overdrive. It must be properly positioned so that oil can lubricate the complete overdrive. 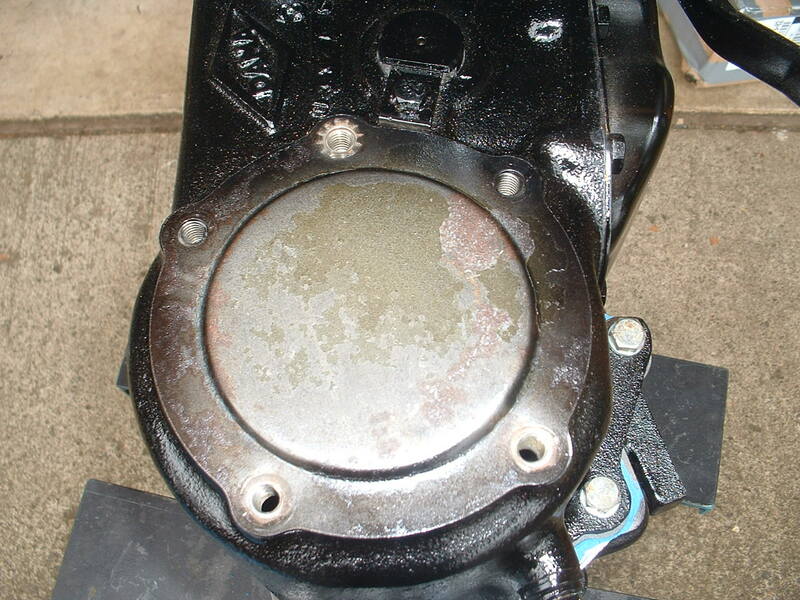 This oil scoop can not function properly unless your transfer case is full of oil. Fill oil to the bottem of the fill plug. The oil scoop install approximately 7/8″. Making sure the oil scoop is tight and does not move. This can be accomplished by taking a screwdriver and twisting it into the trough after installation. Please make note of any oil leaks you have had previously as if the leaks continue it will lower the level in the transfer case and the overdrive will not get the proper lubrication. 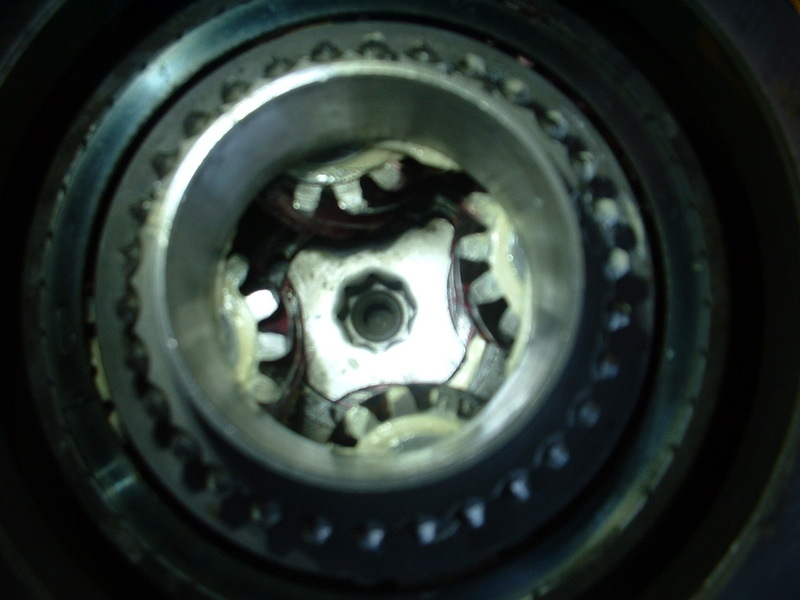 If the oil level gets to low it will not be able to lubricate the bearings and planetary pins, and failure will occur. If your overdrive pops out of gear, please call me and we will determine a correction. 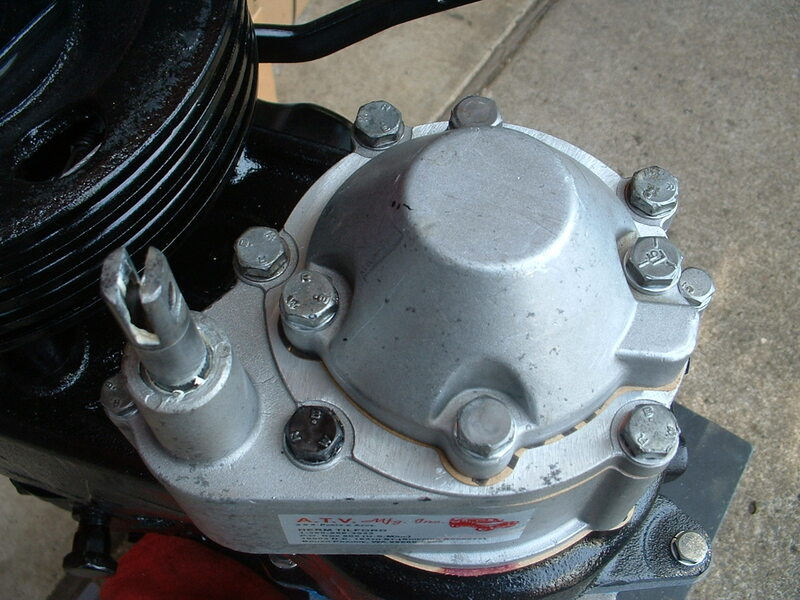 This is caused by a misalignment of the syncromesh caused by a non-origional replacement transmission parts or transmission adapter kits that are not set up with the proper tolerances for the overdrives. If you encounter difficulty shifter, this can be caused by a precision machining of all component parts. They have a tendency to stick when new. They need a little break-in period. If you have questions please call. Above all, keep the oil level up and the overdrive will perform for many years. I recommend minimum downshifting to prolong the operation of your overdrive. Even though the overdrive is syncronized, it is hard on the syncromesh to downshift at a high speed. All products are sold and distributed by our company without exception. Warranty is limited to repair or replacement. We do not offer any type of labor allowance and all warranty claims are subject to inspection by ATV Mfg. Overdrives are warranted for a period of 1 year from date of shipment. These products will be free of defects in material and workmanship under the customary and normal installation, use, and service. We will not warranty any units that have not had adequate oil and maintenance. If at any time within the one year warranty period you have a problem or a claim, simply return the assembly prepaid to ATV Mfg with the original invoice of sale along with the problem you are having and the assembly will be inspected and repaired. If it is found that lack of oil, abuse, or improper installation was a determining factor other charges may apply. 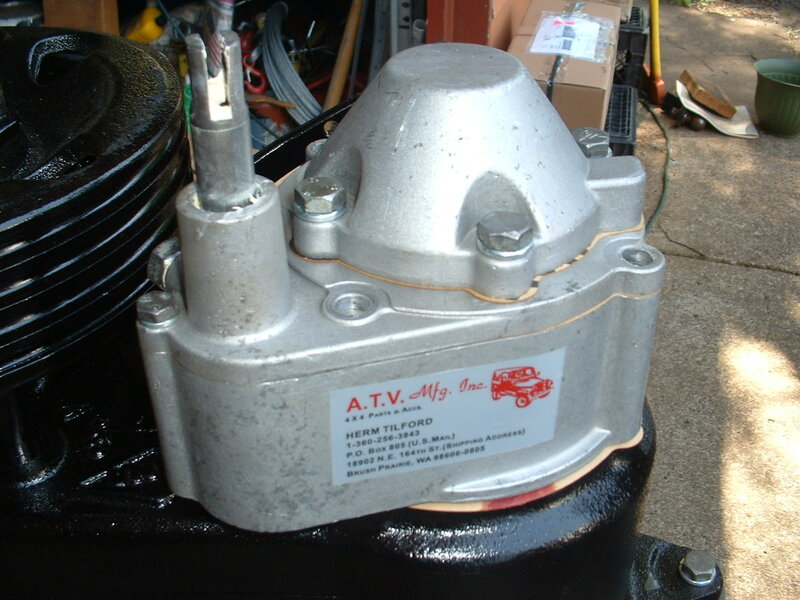 ATV Mfg will accept returned parts if they are in the original packaging and unused and not installed. Any deviation from this policy will be subject to a 20% restocking charge. It will be at the discretion of ATV Mfg whether the products in question can be repaired or replaced if found defective.